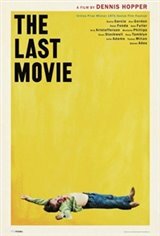 With a barrage of cinematic distancing devices at hand (flashbacks and flash-forwards, super-imposed titles, missing frames, projectionist cue-marks placed in the wrong locations in a film reel), Dennis Hopper concocts a hallucinatory acid-trip concerning an American movie company making a western in Peru. In a remote mountain village in Peru, a Hollywood film company wraps up shooting a western and returns to California. Staying behind is a young stunt man, Kansas (Dennis Hopper). In the village, he takes up with the resident whore, Maria (Stella Garcia). At this point, the film flash-forwards to Kansas being crucified by the villagers. Back in the old time frame, the Peruvians decide that they want to make their own movie. Not having the necessary film equipment, but plenty of local raw material, the villagers construct the needed cameras, microphones, and sound recorders out of bamboo, and although the equipment is faked, the villagers substitute real, bloody violence for the make-believe violence of Hollywood. During this eruption of violence in the Peruvian village, the local priest (Tomas Milian) blames Kansas for the carnage. The priest decides that movies are the root of all worldly evil and convinces the villagers to seize Kansas.